Based out of Lehman College in the Bronx and led by percussionist, composer, and arranger, educator Victor Rendón, The Bronx Conexión Latin-Jazz Big Band brings together the excitement of big band jazz, Latin rhythms and the virtuosity of twenty-one seasoned musicians and special guests, John “Dandy” Rodriguez, Lew Tabackin, Lou Marini Jr. and Claudio Roditi. Modeled after the standard big-band format, the ensemble draws inspiration from the orchestras of Tito Puente, Machito, Tito Rodriguez and Mario Bauza but the vast majority of the repertoire is original compositions and arrangments, composed by Rendon, Rick Faulkner, and Joe Mannozzi. Tunes that, musically speaking, run the gamut – from straight-ahead New York Mambo to danceable Latin-Jazz and Brazilian and Afro-Peruvian rhythms. True Flight is a swinging affair and a testament to the ensemble’s virtuosity, versatility, and ability to create music that appeals to a wide audience. I spoke with Rendón about his life, career, the origin of the Bronx Conexión Latin-Jazz Big Band and True Flight, which will be released on April 1, 2016. How long has the Bronx Conexión Latin-Jazz Big Band been in existence? The band was formed in the fall of 2012. I’m now in my thirteenth year co-directing the Lehman Latin Jazz Ensemble with my colleague, Armando Rodriguez. After directing this student/community band for ten years and getting good results, it occurred to me that I could do the same and perhaps even better with a group of professional musicians. So, I formed the Bronx Conexión Latin-Jazz Big Band and, with the permission and blessing of the music department, started rehearsing with many of the musicians in the Lehman ensembles. It began mostly as a “jazz” rehearsal band. I had some Count Basie, Thad Jones, Mel Lewis and Bob Mintzer, stock charts but I quickly realized that playing standard charts is good but it has already been done, and it gives no identity to the band. Soon, myself, Rick Faulkner, and Joe Mannozzi began bringing in arrangements and compositions. Rick leans more towards original compositions, and Joe has taken several of my compositions and “covers” and arranged them for the band. The group is modeled on a standard big band format that consists (with some variation) of five saxes, four trombones, four trumpets, and a rhythm section. The format peaked in the 1930’s with the bands of Glenn Miller, Benny Goodman, and Tommy Dorsey among others. As I was growing up in 1970’s, I was attracted to the orchestras of Buddy Rich, Stan Kenton, Gene Krupa and Woody Herman among others. At the age of nineteen, I enrolled at North Texas State University (now renamed the University of North Texas), which has one of the best jazz music departments in the country. In addition to small groups, they had nine or ten jazz bands, which were called LAB bands. You had to audition, and the atmosphere was very competitive. I managed to play various semesters in a LAB band. My dream, at the time, was to one-day play with the likes of Stan Kenton and Woody Herman. Later, when I started listening to Latino music, I noticed that many of the bands had a similar big band format. I’m referring to Tito Puente, Machito, Beny More, and many others. In addition to participating in the LAB band program, I also took arranging classes that concentrated mostly on writing and arranging for big band. I’ve had several smaller groups in the past. However, when I saw the opportunity to have a rehearsal band, I immediately thought of the big band format. It was something that I always wanted to do, and I felt that now I was ready to face the many challenges of organizing and running such a group. So, to answer your question more precisely, the overall concept is to keep the “big band” instrumentation alive in the Latino format and play music that is interesting and pleasing to the ear. At the same time, at least some of it, has to be danceable so the general audience will enjoy it. Tell me about the repertoire. We recorded nine tunes. However, we have over forty tunes in the book, and most are, original compositions and arrangements by Rick, Joe, and myself. Also, since I started teaching at Lehman, I’ve transcribed many tunes from the Machito, Tito Puente, and Tito Rodriguez repertoire. I also have a couple of arrangements that Chico O’Farrill wrote for my “Havana Blues” CD back in 1998. Ray Santos also gave us some music. So, we have a lot of music, but I have chosen to focus mostly on the original compositions that vary in style. I tend to gravitate more towards straight-ahead “mambo” tunes like “True Flight”, “Generoso”, and “Café Sin Leche.” However, we have some beautiful boleros, Cuban son style tunes, Brazilian and Afro-Peruvian grooves, plena, 6/8 bembé, and so on. With this varied repertoire, I hope to reach a diverse audience that enjoys a variety of styles, moods, and tempos. As I said before, Rick Faulkner brings in his compositions, which are fantastic and fun to play. We must have at least twenty tunes composed by him. My original compositions like “True Flight” and “Café Sin Leche” were originally written for another group, called Blue Mambo. I turned them over to Joe Mannozzi, who, in turn, arranged them for Bronx Conexión. I have other compositions that have not been recorded. How difficult, or how enjoyable is it, to lead a big band in today’s economic climate? I’ve been a sideman, leader of trios, quartets, quintets, etc. for years. To me, nothing is more exciting than leading a Big Band. It does come with its pluses and minuses. The first minus is that I’m dealing with twenty-one musicians who need to work. It is tough to find venues that will pay enough to cover a decent wage for a group of this size. So when a member has a paying gig and can’t make a rehearsal or the monthly performance at the Nuyorican Poets Café. I have to be flexible. One day, I hope to take the band on tour. If and when that happens, it will be a logistical nightmare scheduling flights, rooms, and so on. Hopefully, I will be in a position where someone will do it for me so that I can concentrate on the music. The plus is, musicians like to play in a big band format. I could never get musicians to rehearse with my smaller groups unless we had a paying gig. This band rehearses twice a month with very few problems. Also, as the band improves, it attracts other good players. it’s seen as something special, interesting, challenging, and different. Hearing the rhythm section and the lines and harmony of fourteen horns is a natural high and very exciting. What are your expectations for True Flight? 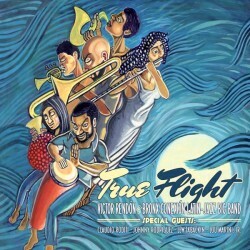 True Flight is our debut recording and the beginning of a musical journey. The band has already proven its high level of musicianship through its performances and this recording. I expect to have this band for a very long time, performing at the highest musical level, and future recordings. The cover art is striking. Who created it, and what does it signify? My son, Victor Manuel Rendón created the cover art. He is a graduate of the School of Visual Arts in New York City. He also did the cover for my Fiesta Percusiva CD and another CD: Blue Mambo – Rico y Sabroso. What I tried to get him to convey is, the musicians going up into the air, musically searching themselves and following a journey of creation and thus, True Flight. The album is dedicated to your brother, Rene. He died unexpectedly two years ago. In 1965, he bought my first pair of drumsticks and a practice pad for fifteen dollars, which my mother could not afford. He earned the money working in the cotton fields of Texas during the summer; to put himself through college. He didn’t know it, but the simple act of generosity was the first step towards what I would do with the rest of my life. Tell me about your relationships with Lehman College and the Nuyorican Poets Café. I’m an adjunct lecturer at Lehman College. This is my 13th year co-directing the Lehman Latin Jazz Ensemble with my colleague, Armando Rodriguez. In 2003, the Dean wanted the music department to start a Latin band. Armando and I were both hired to run the group. We began with two or three horns, and it gradually grew into a student Big Band with nearly thirty musicians. It’s now one of the most popular ensembles on the campus. I also give lessons to students who enroll for Latin percussion instruction. My friend, teacher, and mentor, Morris “Arnie” Lang (Philharmonic Emeritus) is the head of Percussion and he directed the Lehman Percussion Ensemble for several years. I played in the ensemble for two years. This past fall, he made the decision not to direct the Percussion Ensemble. With his blessing, I took over the class. I have kept the classical percussion component but I am also introducing World Percussion to the repertoire. We have performed pieces by Steve Reich, Bob Tilles, and Morris Lang. We also do guaguancó, yambú, bongo repiques, and some batá. Bronx Conexión started its residency at the Nuyorican Poets Café in September of 2014. It’s a great place to perform and a great way to polish and try out the music in front of a live audience. We always have a good audience who our performances very much. Will there be a CD Release party? Yes, our CD Release Party will be at the Nuyorican Poets Café on April 12th, at 9:30 pm. We are at the Nuyorican Poets Café in New York City every 2nd Tuesday of the month. For the past three years, in November, we have performed at the Johnny Pacheco Latin Music & Jazz Festival at Lehman College. Now that we have a recording, some things are brewing, but I would rather announce those events when they are confirmed. Congratulations on an impressive debut. I look forward to experiencing the big and in a live setting. Tracks: True Flight, Generoso, Café Sin Leche, Europa (Earth’s Cry Heaven’s Smile), Buena Gente, Island Woman, Oriente, Lagos, No Woman, No Cry. Personnel: Victor Rendón – timbales, batá (Iyá), shekere, quijada (jawbone of donkey), frog rasp, rainstick; Wilson “Chembo” Corniel – congas, batá (Itótele), campana, woodblocks, clave, ocean; Cascadú – shekere, cajón base, batá (Okónkolo), pandeiro, cuica, triangle, cricket, tan-tan, shakers, frog rasp, woodblocks, windchimes, pods, rainstick, and other miscellaneous; Yasuyo Kimura – bongó & cencerro, shekere, guataca, shaker, cajón repicador, frog rasp, agogo ; Cascadú – Vocals, “Island Woman” & “No Woman, No Cry” ; Ron Smith; Flute – Jessica Valiente, Alto Saxophone – Al Acosta, Alto Saxophone / Clarinet – Debra Kreisberg, Tenor Saxophone / Flute – Joe Stelluti, Chris Stelluti, Baritone Saxophone / Clarinet – Karl Watson, Trumpet / Flugel – Anibal Martínez, Guido Gonzalez, John Replogle, Kathleen Doran, Trombones – Rick Faulkner, Piano – Joe Mannozzi, Bass Ray Martínez. Guests: Claudio Roditi – trumpet solo on “Café Sin Leche” & “Lagos,” Jennifer Freedman– support vocal on “No Woman, No Cry, ” Johnny Rodríguez – bongos on “Generoso”, “Europa”, & “Oriente, ” Jorge Maldonado – maracas & güiro on “Generoso”, “Europa” & “Oriente, ” Lew Tabackin– tenor sax solo on “La Buena Gente,” Lou Marini, Jr. – tenor sax solo on “Island Woman, ” Jorge Maldonado – maracas, guiro. Drummer/percussionist Victor Rendón is a highly respected educator, author, and veteran of the New York City Latin music scene. He has studied intensively for many years with Jimmy Ramirez, Dr. Rosemary Small, Louie Bauzo, John Almendra, “Little” Ray Romero, Frankie Malabe, Mike Collazo Sr., Pablo Rosario, Changuito, Roberto Borrell, John Amira, Morris “Arnie” Lang, Jerome Goldschmidt as well as jazz drummers Paul Guerrero, Henry Okstel, & Charli Persip among others. He has worked as a sideman with Mongo Santamaria, Chico O’Farrill, Carlos “Patato” Valdés, Ray Santos Orchestra, Grupo Caribe, Latin Jazz Coalition, The “New” Xavier Cugat Orchestra, Grupo Latin Vibe, Los Mas Valientes, Rudy Calzado, and many others. As an author/transcriber, his work has appeared in Modern Drummer, Percussive Notes, LP Newsletter, Music in Motion Films, DCI Music Video, Drum! Magazine, and Warner Bros. Publications. 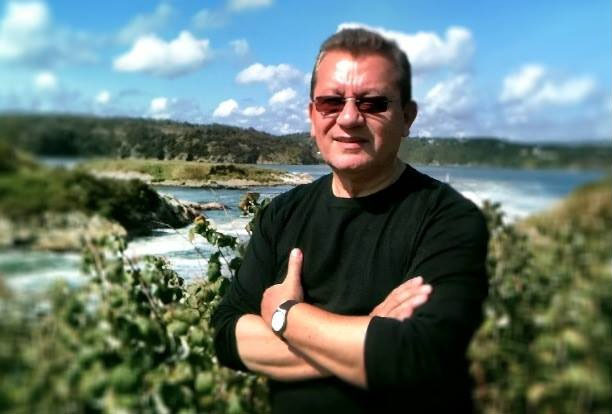 He is the author of The Art of Playing Timbales distributed by Alfred Publishing. For several years, Victor also published his semi-annual magazine, Latin Percussionist. Rendón, who holds a Bachelor of Music from the University of North Texas and a Masters degree in education from Hunter College, has had a lengthy career teaching instrumental music and Latin percussion in the New York City Public Schools. 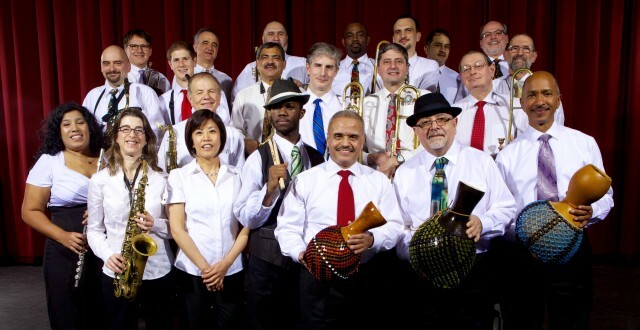 Formerly co-leader of the Rodríguez/Rendón Latin Jazz Orchestra, he now leads the Bronx Conexión Latin Jazz Big Band and the percussion group: Co-Tim-Bó. Currently, he teaches and directs the Latin Jazz Ensemble at Lehman College in the Bronx. A successful clinician, he conducts workshops in Latin percussion styles. Mr. Rendón is an LP, Sabian, Vic Firth, and Evans performing artist and educator.